With so many PEX tools and fittings available it can often be difficult to select the right tool for your job. The information and compatibility table on this page will help you make the right choice for your job. 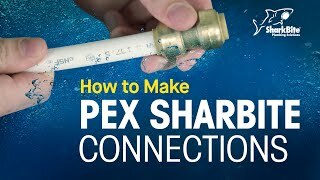 If you are a DIY and have a one-time PEX job with a small number of connections you can utilize the SharkBite connection system. SharkBite fittings are easy to use and although they are expensive per fitting, they don't require a PEX tool. 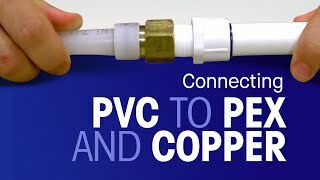 Therefore the simplest and most inexpensive way for a DIY to complete a small PEX job is with SharkBite PEX fittings. As you can see from the table, SharkBite fittings are compatible with all standard ASTM size PEX pipe, they can also be used with copper pipe. They can't be used with PEX-AL-PEX pipe. For DIY's or professionals with a large one time job, or if you plan on having PEX jobs in the future, you will have several different options. These options include the Wirsbo Expander System, the PEX Crimp system or the PEX Clamp system, and the Viega Press System. We will discuss each of these in more detail and make some basic recommendations. The PEX Crimp System and PEX Clamp System are the most simple and most often used by DIY's, however they are also popular with professionals in certain areas of the country. Both of these systems make use of the same barbed crimp fittings. SupplyHouse.com sells the HydroPEX line of crimp fittings that can be used with either of these systems. The difference between the two fittings is that the PEX Crimp System uses a Crimp tool and copper crimp rings, while the PEX Clamp System uses a Clamp Tool and stainless steel clamps. In terms of a recommendation here, the clamp system is slightly easier to use and cheaper. These systems can be used with any standard ASTM size PEX pipe, but can't be used with PEX-AL-PEX. The Uponor Wirsbo Expander system is perhaps the most widely used PEX system by professionals in the US. This system makes use of the ProPEX Expander Tool ProPEX Fittings, ProPEX Rings, and PEX-a tubing. 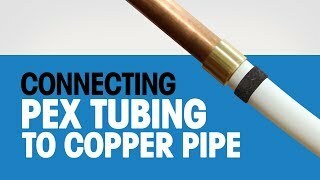 If PEX-a tubing (AquaPEX) is not used the connections will fail. This system makes strong reliable connections that have never failed in the field. The only downsides to this system are the high up-front cost of the tool, the high price of fittings, and the fact that Wirsbo only wants professionals using the tools. Wirsbo has addressed the price of fittings by coming out with engineered plastic fittings that are more cost effective. Using the tool can be a little tricky at first, and Wirsbo prefers that only professional installers use their products. The Viega PEX Press System is growing in popularity with professionals across the country. It has recently become available to DIY's through the Internet. This system utilizes a Viega PEX press tool PEX press fittings, and Press Sleeves. Some people have tried to use the PEX Press tool with crimp fittings, and for the most part it has worked, but this is not recommended by the manufacturer, and they will not honor the warranty if a leak occurs. Contractors in our local area enjoy working with this tool due to its ease of use and the strong connections it makes. The Press technology is unique to Viega and has been used for many years. Similar to the Expansion system, the only downsides to this system are the high up-front cost of the tool, the high price of fittings, and the fact that Viega only wants professionals using the tools. This system can be used with any standard ASTM size PEX pipe, and Viega FostaPEX Tubing. Cut the end of the tubing perpendicular to the length of the tube. All of the material or burrs that are created from the cut should be removed. Slide the ProPEX ring over the end of the PEX Tubing. The ring should be extended over the tube by 1/16". Separate the two handles of the tool, and slide the expander head into the PEX until it stops. Bring the handles together to expand the tubing. Remove the head from the tube and rotate a 1/8". Slide the tool head into the tubing in the newly rotated position and expand again. Repeat the expansion process until the tubing and ring are snug against the shoulder of the expander head. For 1/2" make 2–3 expansions, 5/8" make 5–7 expansions, 3/4" make 7–9 expansions, and 1" make 12–14 expansions. When tubing is expanded, remove the tool, and insert the fitting. There will be some resistance as the tubing slides over the fitting. The tubing and ProPEX ring must be seated against the shoulder of the fitting to secure a proper connection. Note: ProPEX connections can't be made for PEX-AL-PEX Tubing. 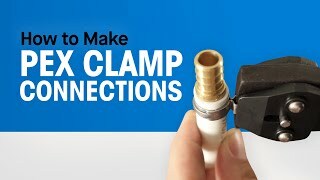 Clamping connections may be made on any brand of PEX Tubing. However, it may not be used on PEX-AL-PEX Tubing. Clamps come in 3/8", 1/2", 5/8", 3/4", and 1". 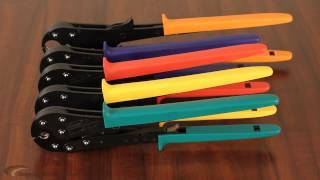 These clamps all work with the same clamping tool and may be used with the different sizes of PEX Tubing. Cut the PEX Tubing so a straight end is created. Slide the clamp over the end of the tube. Insert a SSC fitting into the tube so that the tube is fully covering the inserted barb. The clamp should then be moved between 1/8"–1/4" from the end of the tube. Place the opened jaws of the ratchet tool over the ear of the clamp. Compress the tool until you feel a click, then lock it in a perpendicular position. Compress the tool handles together to complete the connections. The tool will release when assembly is complete. 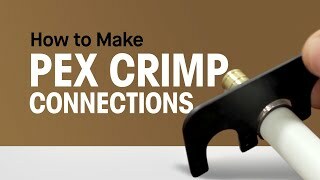 Note: Crimp/Clamp connections cannot be made for PEX-AL-PEX Tubing. Compression fittings may be used to make connections for PEX and PEX-AL-PEX tubing. Compression fittings do not require a special tool. SharkBite Push-Fit Fittings are designed to simplify pipe installation. The fittings allow users to connect pipe in seconds with ease. Instant push-fit connection for increased ease of use. Certified to 200 psi and 200°F (93°C). Fits OD controlled copper, CPVC, or PEX pipe. Body composed of solid DZR brass.